Browse: Home / trojandroid – an android simple trojan app. Notice : This post just For Education Purpose Only! 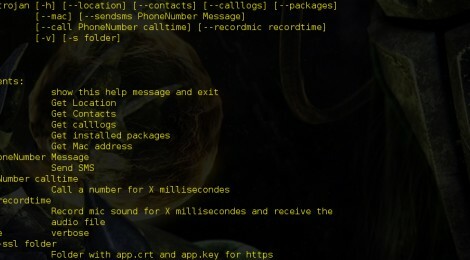 the purpose: How to Infect and Inject trojan into APK File, and re-upload on your server or google play store using MiTM. This project was to make a simple trojan app, to get information from the phone or to perform some remote action with the phone (send sms …). the second part was to inject this trojan into another app package (APK), so the trojan can be quietly install without the user noticing. Try to build the app and launch it on your phone. this app don’t use any java library who isn’t include in the android SDK to avoid error when it will be inject in other app. The Trojan configuration is hardcode to avoid the dependence with any external XML. You can modify the “port” variable if you want, but it isn’t recommended, you can have some errors with a non standard port for https. Run the app on your phone or on the emulator (MaJ+F10), the generate APK will be use later. the app is pretty simple, it’s just an infinity loop in a background service who ask every 4000 seconds to the Trojan server if he had to do something, if he had he try to do it and send the result to the Trojan app, the service is relaunch every time the user unlock his phone. So this is a python script who use the wonderful APKTOOL to inject the trojan into another APK. the script unpack the two APK, copy and modify the smali code of the trojan into get10 package, a few modification in the manifest is of course necessary, after this get10 can be repack, install and use without any problem. let’s do the magic. if you didn’t have any errors, you should find a file “app-final.pak” in your current directory. the last component of the project, it’s a simple flask script who expose webservice to interact with the trojan. the trojan launch a background service who’s gonna call the webservice continually to see if their is action to execute (send a sms, get the mac address …), if an order,is given to the trojan, the answer is send from the trojan to the server to an another webservice. per default, the android trojan use https, so you have to use the script ssl.sh in the repo to generate private/public key, after that you can just launch a command to get information from the trojan. ← shellcode to exploit the overflow vulnerability on windows to get remote code execution.